The Widowmaker folded space and emerged four light years from where they had departed. The Schrodinger Generator in the ship was in good working order. It had to be since any malfunction could send them to the other side of the galaxy or into the middle of some place never charted. There were stories of Schrodinger Generators that malfunctioned and sent the crew to some place unknown on any star chart. In such cases, there was no way to navigate a return trip. 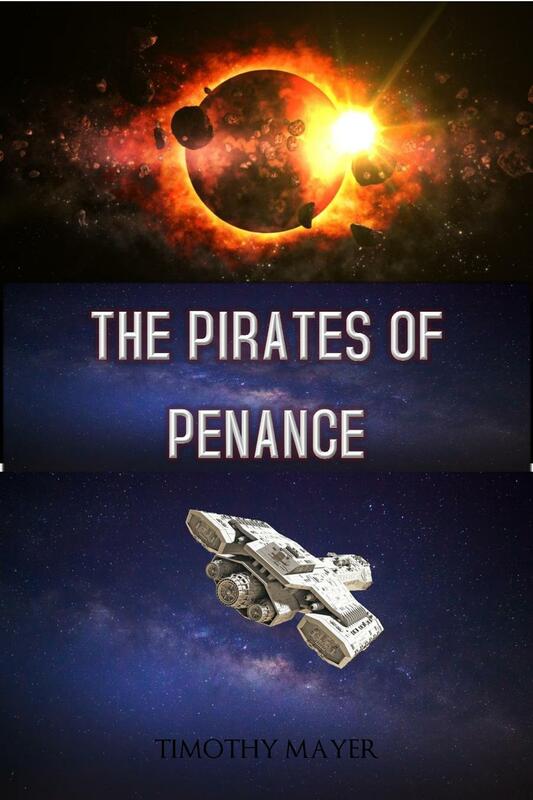 A few tales were told of ships that ended up in the wrong place in a different galaxy and made their way home on sheer luck and ingenuity. Shakti thought such stories were made up to scare children. This was a test run of the corvette with its new crew. They’d trained long and hard to learn how to operate the corvette and learn its weapon systems. The Widowmaker had four rotating laser systems for most fights, but it carried twelve nuclear weapons with their own propulsion systems. Most space battles took place with the lasers used first and boarding an enemy ship as the final assault. The nuclear weapons were the choice of desperation since they had a nasty tendency to detonate too close to the ship that launched them. Whatever the evolution of the wasps, the empire found their adversaries did much the same thing when it came to weapons. It was always a matter of scale and precision. Death rays were the stuff of fairy tales. Since it was a test run, the Widowmaker was not sent too far into the frontier. The plan was for them to travel to a known point in a part of space used by the navy for maneuvers, then return. Shakti stood at the control deck and watched the generator in operation as Chimata activated the system. They were all in the command center since the entire contingent of war brides were needed to operate the corvette. It happened very quickly. They felt a sense of disorientation and the ship was at the rendezvous point. “Are we where the drive was supposed to take us?” Shakti called out to Tara who was in charge of the coordinates. She was floating over a chart of numbers when the corvette emerged in its new location. Shakti grabbed one of the handholds and pulled herself over the screen. Kamala stared at it for a while. On the screen, she could see a rendition of a small ship outfitted with short-range lasers. It was meant for offensive uses, but at least it had a human look to it. This couldn’t be a wasp ship. “Do you want me to see if I can make contact with them?” Salina called to Shakti. She turned her purple eyes in Shakti’s direction and tried to control her zero gravity float while reading the spectrum near the ship. For a young woman of eighteen, she learned the communication systems of the corvette faster than anyone expected. Salina nodded and returned to her screen. She punched out a code for a wave beam. It would fold itself back across space and end up near the other corvette. “Are we operational on the forward cannons?” Shakti asked Lashmi. She had the fastest response time of any of the warbrides and it made sense to put her in charge of the lasers. The use of the nuclear weapons was reserved for the captain of the ship, which in this case was Shakti. “Just keep them ready,” Shakti told her. They’d only test fired the lasers a few times and she didn’t feel confident in using them. The corvette moved slowly into positon and began to track the other craft. They couldn’t get a decent visual on it as it was moving in a different pattern than they anticipated. The new ship used a small planetoid to avoid detection and moved behind it, but the corvette turned in space and followed its path. They used the planetoid to block most of the radiation from the nearby star and try to pursue the new ship. “Did you get any kind of identification on it?” Shakti asked Durga, who was in the process of going through the files to see if it matched any known spacecraft entered into the logs of the empire. So far, she couldn’t find a thing. It appeared the new object was built from many existing ships. It used bits and pieces from someone had merged together from scrap yards all over the galaxy. The amount of detail worked into it was quite impressive and the engines were giving the ship exceptional maneuverability as they tracked it across the event horizon. She stopped talking long enough to look at the other woman. They had the same idea. Both stared at each other in silent recognition and didn’t say a word. “Go ahead,” Shakti confirmed. “It sounds like something we all need to hear.” Salina made a few adjustments on her screen. The head of a prefect formed in the middle of the command center. It was in response to the request Shakti had sent earlier about the new ship. The head began to speak slowly. “I think that means take them out,” Kamala shouted from her station. “How do the lasers appear?” Shakti asked her cannon operator. “We have full power,” Lashmi told her. “They’re still too far away to use them. You’ll have to bring that pirate ship closer in range before we can take care of them. “Are you going to give them the option to surrender?” It was Bravi. Shakti could see her nostrils flare in excitement. “I was hoping you would say that,” Kamala commented from her post. Shakti watched the other warbrides grin in anticipation. Lashmi found the torpedo she wanted to use. It was loaded and ready in the front chambers attached to the habitat part of the Widowmaker, but it did not spin like the rest of the living area. It needed to be stationary to send its deadly cargo forward. The torpedo hold was a small part of the ship and was anchored to the front shields. Since the torpedo was independently operated, it could be deployed from any direction. Once fired, it would find its way to the target. She punched in the coordinates so that the torpedo would detonate a good distance in front of the pirate ship and let them know the firepower her corvette carried. She made a final entry and pushed a button. “Torpedo away!” Lashmi yelled, as they watched the bright light of the propulsion unit flare in the distance from the corvette. Seconds later, it found its final course and began to move in the direction of the pirate ship. There was silence as the image of the torpedo appeared in relation to its target on the holographic display in the middle of the command center.